When I was a young newlywed, I’d always heard of the beauty of the slow cooker and what delicious roasts you could cook in one. Well, the first time I tried, it was an utter disaster. The meat was tough and chewy. I’m not sure it was even edible. I gave up on roasts for about five years. And then I learned a few tricks. I asked friends who made delicious roasts. I read recipes. And I figured out some general guidelines for a great tasting roast. The following are some tips to help you enjoy roasts, like we do now, with the ease of the slow cooker. Some cuts of meat are meant for braising, others are for dry roasting. Braising is when food is browned in fat, then cooked, tightly covered, in a small amount of liquid for an extended period of time, exactly like the slow cooker. I like to use boneless chuck roasts for this type of dish. I prefer this cut because it is generally fairly lean, easy to carve, and fairly economical. I stock up on roasts when they are $2.49/pound. My experience is that just tossing a hunk of meat into the slow cooker is not going to result in the depth of flavor or tender texture that you will get if you brown the meat first. Yes, it’s an extra step, but it totally pays off in the end. It is worth the ten minutes and a dirty pan. 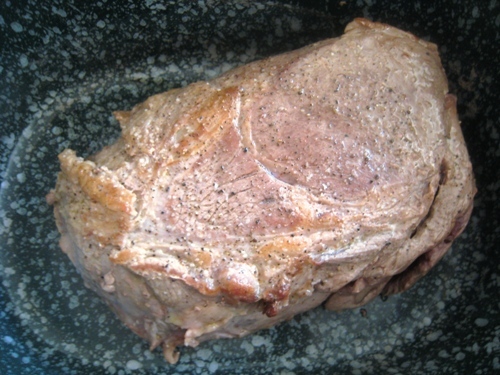 I simply salt and pepper the roast well and then brown it on all sides in a little hot oil in a skillet. Remove the roast at that point and place it in the slow cooker. Next I want to add some flavor. I saute some aromatics in the drippings left in the skillet. Add chopped onions, garlic, or shallots to the pan. Cook them on low heat until clear and starting to brown lightly. You can even saute chopped carrots, turnips, mushrooms, or other hearty vegetables at this time. You don’t need a lot, only about 1/4 to 1/2 cup. As you add the liquid, stir it well with the aromatics and scrape up any browned bits from the bottom of the skillet. You can also add fresh herbs and spices at this point. Add this mixture to the slow cooker. Cover. Turn the heat on low and walk away for 6 to 8 hours. The meat should be meltingly tender at the end of the cooking time. 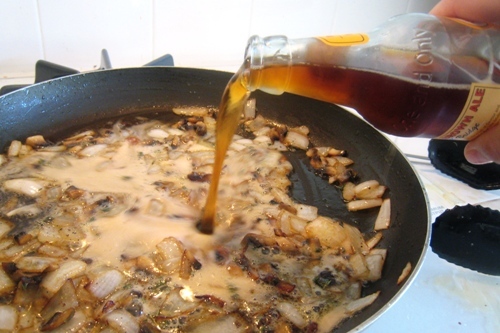 Remove it from the cooker and while it rests, you can create a gravy or a pan sauce with the remaining liquid. Just in time! I’m cooking a roast this weekend, and I was looking for new ideas…. My roast ALWAYS falls to pieces in the crockpot. I’d love to have a pretty roast like the one pictured:) I’ll have to try your method. This is going to be Sunday dinner this week. Thanks for the tips! No, it’s very little liquid. Your recipe sounds delicious! I thought I’d add my own method to the mix. My roast falls to pieces too, but I like it like that! I put the roast directly into the slow cooker. Then I combine brown gravy mix with 1-2 cups of water and pour it over the meat. If I want veggies, then I cut up carrots, potatos and onions and put that in before the gravy. 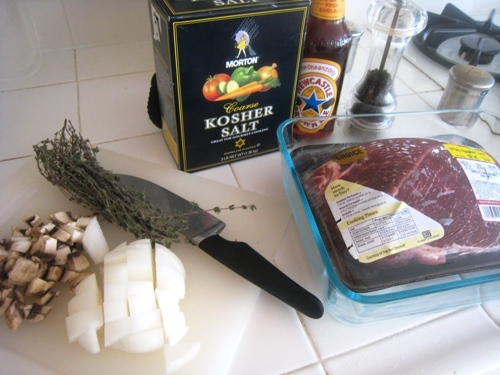 (I have also used dry onion soup mix but I prefer that with pork and the brown gravy with beef). Thank you for posting this! I was just commenting to my husband on how I needed to start doing more meats in the crock pot, but I wasn’t sure how to do it. @Ellen, lately, cross rib roasts have been good. This was amazing! So tender & juicy! I buy beef in bulk, a quarter at a time from a local farmer, so I had to use a bone-in chuck roast but still it worked great. This recipe is worth it’s weight in gold…we ate the best pot roast I’ve ever made last night after following your recipe. We used beer like you do in the photos, and the aromatics and nearly caramelized onions made all the difference. 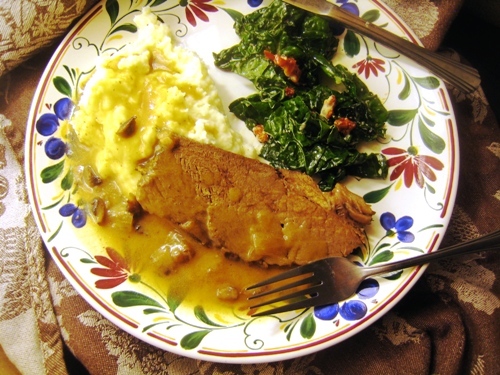 The gravy for this roast was to-die-for, and the meat was so flavorful and tender. 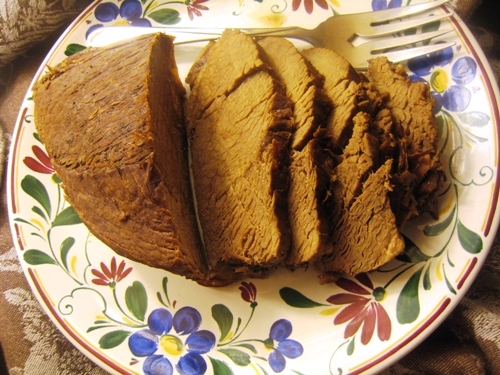 I have been searching for seven years to find the right slow cooker pot roast recipe, and yours just nailed it! Thank you so much…this is divine dinner!! @Brooke Kingston, fun! And the beauty is that it’s a non-recipe. You adjust the flavors to match what you have. You can make unlimited combinations with success. So glad that it worked well for you! Awesome! The method of browning first made an alarmingly huge difference in the flavor. Great tip! Yep. I am a big opponent to those crock pot meals that just dump. It’s just not going to taste as good if you don’t brown it first. Stepping off my soap box…. I’m new to this and this recipe sounds wonderful! I would love to print it, but I don’t see a printer friendly recipe. Help! There isn’t a “recipe”; it’s a method that you can follow on your own. It is really forgiving. As long as you get the right kind of meat, you can’t mess it up. I really struggle with roasts – for something that seems like it would be super easy, for me, it never has been. Could you please give me a little direction on maybe some sample spices that you might recommend – such as combinations and amounts? I’m embarrassed to admit it, but I need the truly basic info.. Thanks so much! I usually do a generous sprinkling of salt and pepper, and then maybe a teaspoon of basil, oregano, or thyme. 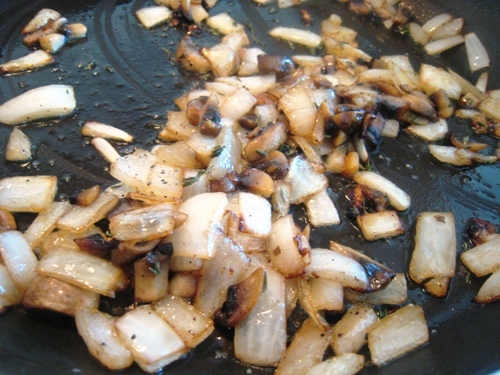 I think adding the other aromatics like garlic, onions, and mushrooms is important. Does that help? Oh.My.Goodness. Thank you, thank you, thank you for this!! I made it last week and it was HEAVEN. I am so excited that I finally made a yummy roast!! lol This will be a keeper for our family. Yay! I was just thinking about this the other day and wondering how it went. Glad you enjoyed it!